Living in Canada as I do, I'm unable to see this myself, but, from the description, it sounds like something I'd enjoy. "For the last half century, Frank Frazetta has dominated the fantasy art world with his visceral images of savage warriors, curvaceous princesses, and fantastical creatures set in the most lavish landscapes. In this critically acclaimed documentary, we journey to a place where up until now, only the privileged have been. 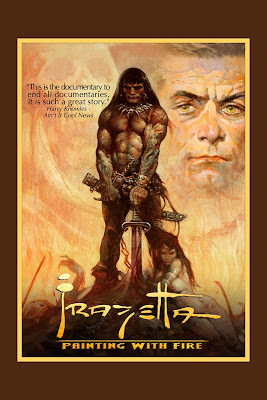 For the first time on film, the reclusive Frazetta reveals to us details of his astonishing life, including how he learned to draw left handed at the age of 70 after suffering a debilitating stroke. Dozens of other professionals candidly weigh in on Frank’s career, including comic legends Bernie Wrightson, Dave Stevens, William Stout, Neal Adams, Al Williamson, Forrest Ackerman and film directors Ralph Bakshi and John Milius. Also appearing are rocker Glenn Danzig, actress Bo Derek and fantasy artists Brom, Simon Bisley, and Joe Jusko. Mirroring the dramatic nature of his work, this film utilizes visual effects and a breathtaking orchestral score to create astonishing results. Painting With Fire tells of a life, the spark of an artist, and what Frazetta means to future inspirations. Frank Frazetta is not just a pop phenomenon, but a creative artist destined for a serious place in art history." The two-disc DVD special edition from Blue Underground of the Bakshi film Fire & Ice has, as the second disc, Painting With Fire. Yes, there is the DVD, which I suppose I could buy. I'll have to think about it, because it does sound very intriguing. I'd like to see it just on the idea of watching Glen Danzig opine on Frazetta. Thanks for the heads up!